It takes a certain type of individual to want to bob around in these conditions. 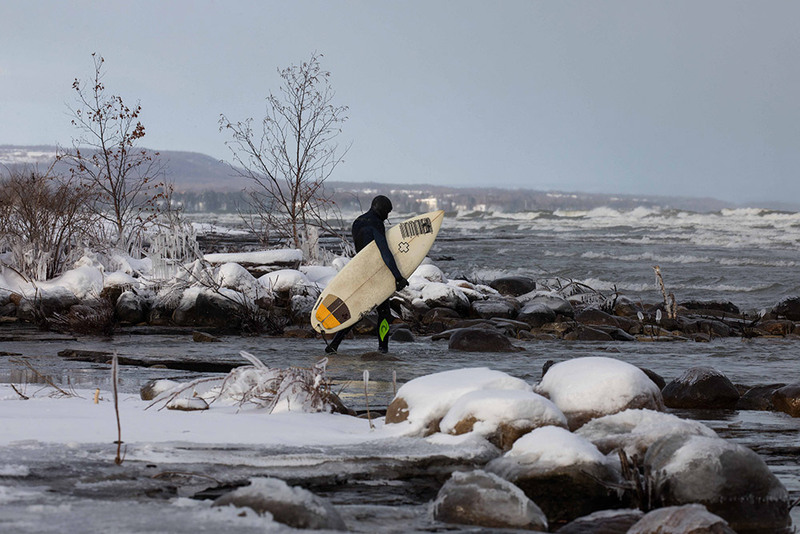 In the UK we are well used to some cold surf in less than favourable conditions but let us give a thought for the dedication of locals who head out to surf the freezing and fickle Great Lakes. These vast freshwater lakes, which bridge the North American and Canadian border, cover nearly 100,000 square miles. 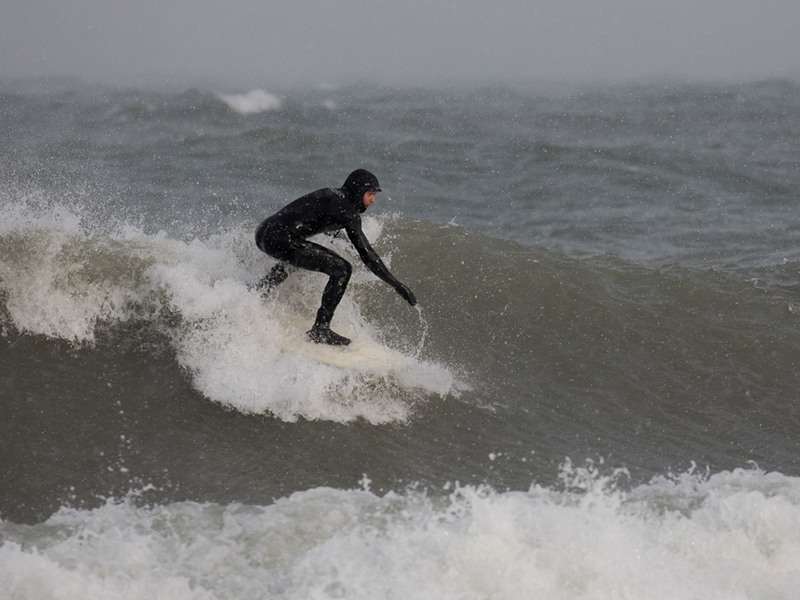 They are famed for their ocean-like characteristics including surfable waves and strong currents, plus in the depths of winter they are incredibly cold. We are talking icicles streaming off your face cold. 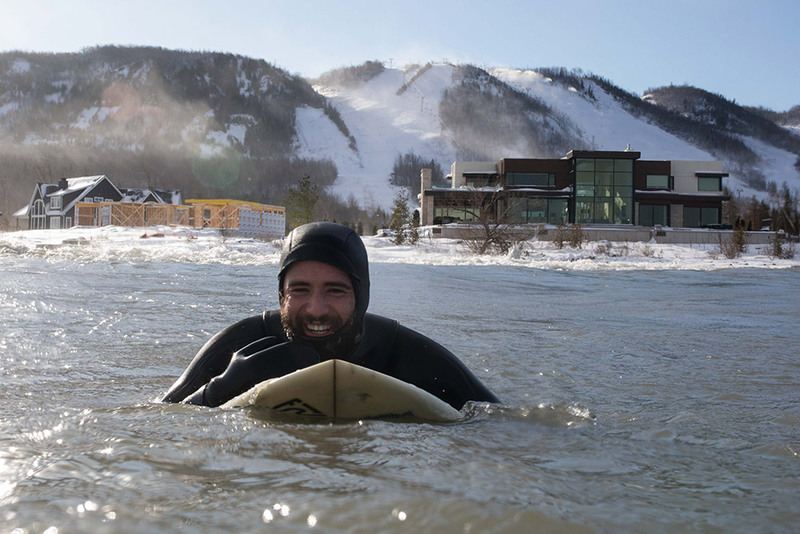 Temperatures have been known to drop as low as -40°C, so spare a thought for the surfers and throw some extra kudos t0 the water photographer who is prepared to float around in those conditions while the others are hurtling towards him on their rock solid sticks. 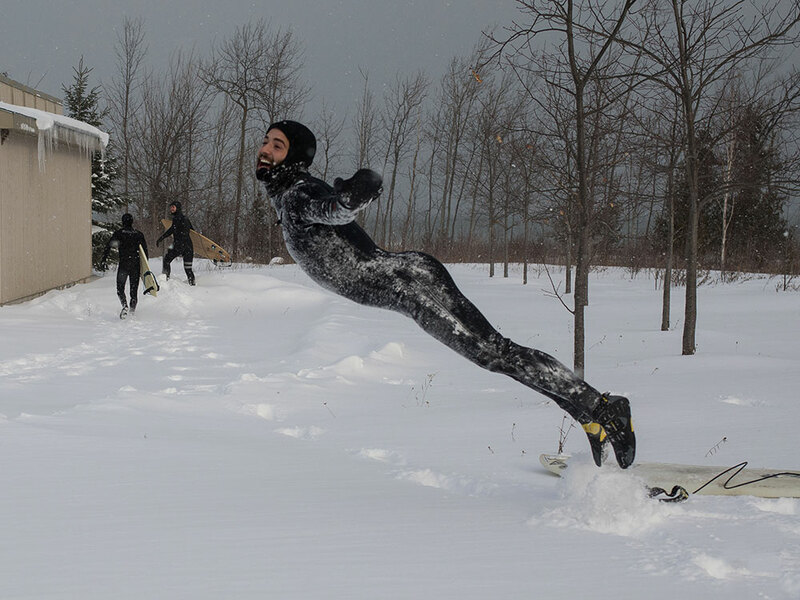 Wavelength caught up Lucas Murnaghan the Canadian photographer who likens his existence to playing their national sport – hockey. Lucas gives us his perspective on life bobbing in the bitter yet beautiful basins that are the Great Lakes. As a kid growing up playing street hockey, I can clearly remember this tricky moment. All the kids from the neighbourhood had gathered ready to play, but there was one issue to be settled. It seemed nobody ever wanted to play goalie . . . except for the guy that did. A collective sigh of relief could be heard, and all was right in the world again. Goalies are a bit different than other hockey players. They train and think differently, they use special equipment, and see the game from a unique perspective. Not everybody wants to be a goalie, and not everyone should. There are a select few individuals for whom standing between the pipes and having hard pieces of rubber fired at them seems like the perfect way to spend 60 minutes. The rest of us can’t fully understand goalies, but we sure are glad to have them. I never wanted to play net, I didn’t see the attraction. That is until I became a surf photographer. It takes a certain type of individual to want to swim around in the line-up instead of surf. We bob around strategically while surfers and their boards are hurtling toward us from unpredictable directions and speeds. We live for perfect days just like our surfer counterparts – we see a big swell and perfect wind conditions and get just as excited. We all frothing and running around the night before like a bunch of kids on Christmas Eve. As you check your board for dings, we are checking the seals on our water housings. A new set of fins for you is a new piece of glass for us. As you wax up your stick, we format memory cards and charge batteries. We both go to bed and sleep fitfully, dreaming of what is in store for us at dawn. I used to think I became a surf photographer because I wasn’t any good at surfing. It seemed like a plausible, if somewhat self-deprecating explanation. Does that mean goalies choose their position because they couldn’t put the puck in the net themselves? Maybe it’s not that simple. Perhaps in the divine balance of the world, there are evenly distributed numbers of people put on this earth to shoot and stop pucks. If we all caught waves and nobody stopped to photograph them, how would we ever know what had happened. If everyone wanted to be a surf photographer, we’d be pretty useless bobbing around out there with nothing to shoot. Just like any ecosystem, there is a symbiosis that exists where both species can benefit each other. A harmony can exist where waves are caught, images are captured, and all are satisfied. 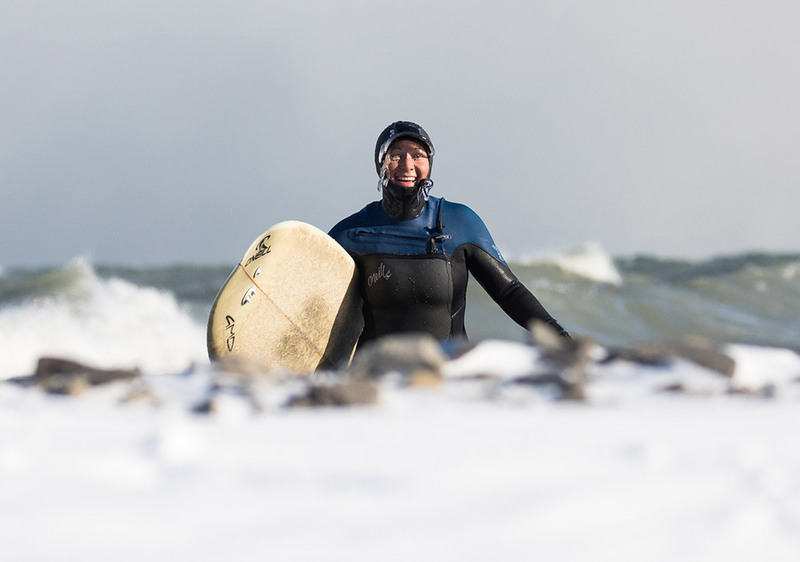 Living and shooting on the Great Lakes, I have watched with delight and pride as the level of surf photography across our community has grown in leaps and bounds. Grainy and awkward GoPro shots have been replaced by professional images which are being shared locally and globally through the internet and print. Through diverse lenses, both literal and metaphoric, a burgeoning community of photographers shares a sense of purpose and responsibility. We capture ephemeral moments in time for the enjoyment of those present, those that could not be, and for those that are yet to come. This hockey season I will watch the game from a new perspective. I will appreciate the individual roles that all players contribute toward a common objective. A team with no goalie is no worse off than a team that can’t score; neither team will ever win a game. From the water, I’ll be looking for new angles and techniques to share different emotions and stories with my community. As a surf photographer, I know that my friends and fans are counting on me to capture the shot. It’s not for everyone, but for those that is – there’s nowhere we’d rather be.